Ranger Design Aluminum Partitions are the toughest, quietest product on the market and the best option to optimize payload without sacrificing quality. Ranger Design Steel Partitions are the perfect option for a low cost, tough, and quiet safety partition. Maximum Impact Resistance: Built from thermoformed ABS and polycarbonate, these partitions uphold a standard of safety set only by Ranger Design. No commercial van-type motor vehicle manufactured after January 1, 1975 shall be operated in this state unless equipped with headerboards or similar devices of sufficient strength to prevent load shifting and penetration or crushing of the driver’s compartment. Such headerboards or similar devices shall conform to the requirements of such devices set forth in the Motor Carrier Safety Regulations of the U.S. Department of Transportation, Federal Highway Administration. Safety partitions provide a solid and secure barrier between the occupants of the van and the cargo. Built from heavy gauge steel, aluminum and thermoformed ABS and polycarbonate, they are designed for maximum impact resistance and uphold a standard of safety. Safety partitions also provide a more comfortable environment for the driver by giving more seat travel and by not rattling as the vehicle drives down the road. A cargo van partition is one of the most important parts of a well upfitted vehicle. 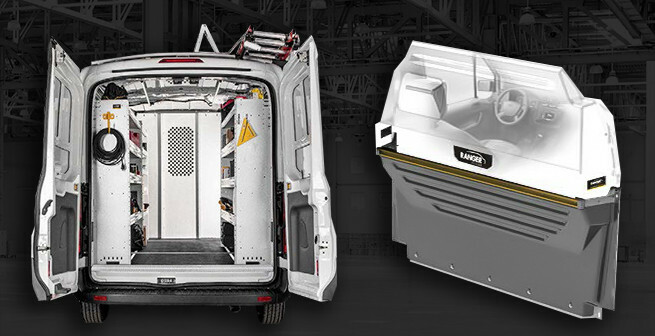 It’s a smart investment for any tradesman who wants to improve the safety, comfort and efficiency of their work van. There are many different styles of cargo van partitions (or van bulkhead as it’s sometimes called) available today and knowing the difference between them can help you make the right choice for your needs. What Is A Cargo Van Partition? In the basic form a cargo van partition is a solid barrier that’s located between the cab of the van and the cargo area. In the event of an accident or sudden stop, unsecured tools and other equipment can become dangerous flying projectiles and the partition’s job is to stop them from entering the cab area and injuring the occupants.